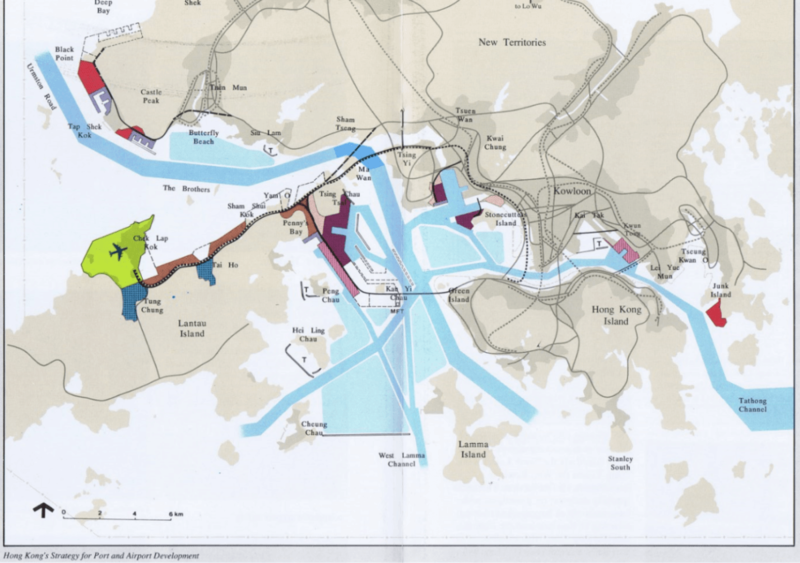 HF: We recently posted the article, Q+A 45 Proposed fixed crossing to Lantau Island, late 1970s. In this I wrote: The Tsing Ma bridge and its neighbour the Kap Shui Mun bridge both opened in 1997 but I have not come across any proposed bridge to Lantau prior to the opening of the new airport. Any information regarding government or private proposals connecting Lantau to Kowloon or the New Territories would be most welcome. Tymon Mellor has responded: There was the big project in the 90’s to reclaim Green Island and container terminal 10 off Lantau, then link them with a bridge carrying road and rail. TYmon has also sent the maps below. HF: Theproject appears to be part of “The Port and Airport Development Strategy (PADS) 港口及機場發展策略) an infrastructure project in Hong Kong, better known as the Rose Garden Project (玫瑰園計劃). n the early 1980s, the Hong KOng Government already foresaw the incapability of the existing airport and container port to keep up with the growth of Hong Kong. The blueprints for the new airport and container port had already been drawn. However, the government decided to postpone the plan owing to the uncertainty of Hong Kong’s future.